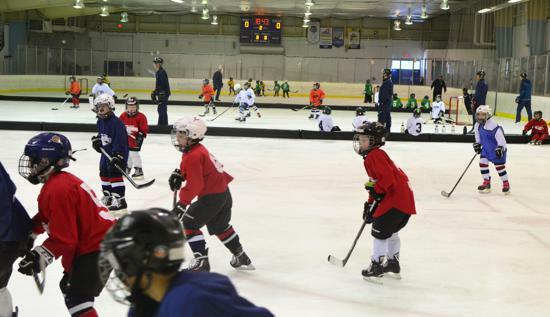 What: The 8U Spring Program follows USA Hockey’s American Developmental Model (ADM) and uses station-based skill development, technical skating instruction, cross-ice games and most of all a fun and safe hockey experience. When: The 8U Spring Program runs from March 10, 2019 through May 20, 2019. The following table shows the ice slots used by the 8U Spring League. There are no events the following dates: March 16-17, April 13-21 and May 4-10. Here are the first two ice slots, used for practice & evaluation. The remainder of the schedule will be distributed after team selection. Structure: Like the Fall/Winter season, we will be dividing the players based on skill level into 2 divisions: Metro and Atlantic. We are expecting 4 teams in each division; however, this could adjust based on registration. After the assessments, players will be placed in either the Metro or Atlantic division and placed on a team. In distributing ice sessions between practices and games, we will strive for roughly a 3:1 ratio of practice sessions to game sessions. Practices will follow USA Hockey’s ADM practice plans. Our plan for Game Days is to have 4 cross-ice games going at once, with the 4 Metro teams playing on two “rinks” and the 4 Atlantic teams playing on the other two “rinks”. We will use bumpers and 8U-sized nets. On game days, teams will play 2 games. Each game will be 20-24 minutes running time with the buzzer sounding every 2 minutes to change lines.